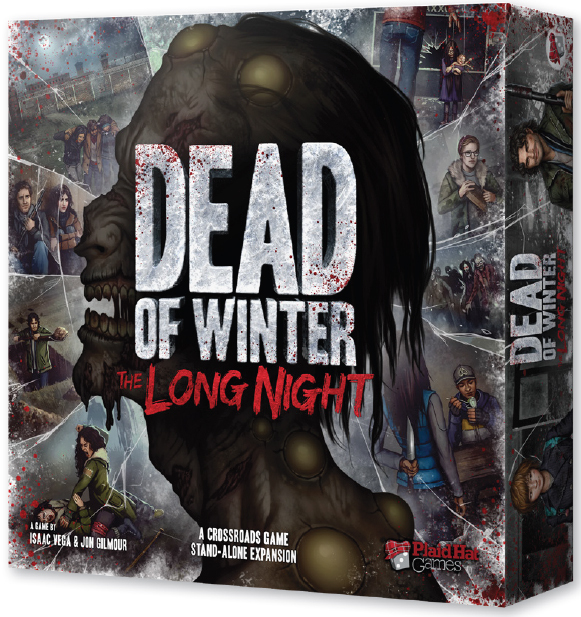 Hot on the heels of UnGeek’s last article, the good folks at Gaming Library, the official distributor of Plaid Hat Games in the Philippines provided us with exclusive details on Dead of Winter: The Long Night, the upcoming stand-alone expansion for Dead of Winter. So these are the facts we gathered, along with some speculations that might be included in the game. Keep in mind that this is not the final product and actual contents, art, and gameplay elements may change when the game is released in August. Let the theory-crafting begin! Based on the description, the stand-alone expansion features a brand-new colony along with new survivors. What’s interesting here is that now you have the chance to customize your colony by making improvements to it. Also, it is stated that the outside locations could evolve at some point due to some random events provided by the crossroad cards… Double-sided location boards perhaps? Additionally, it’s pretty clear that Raxxon, a fictional company from Plaid Hat’s other game called Specter Ops, is present here as one of the game’s 9 locations. We can also speculate that there will be a new type of enemy as “human experiments” were mentioned. Probably the most interesting detail here is the possibility of a colony vs. colony mechanic as bandits could potentially raid and pillage opposing colonies. It is still not clear if this mechanic involves team vs. team aspects or by the use of a random mechanic provided by the game. But it’s still interesting to know that aside from the internal conflicts and struggles each player has, there is also a potential human-threat coming from the outside. As if the zombies and biting cold weren’t enough! Looking at the components list, it seems that there is a good amount of stuff that was put here for it to be stand-alone as well as supplementing the base game in terms of new crossroad and character cards. Fans of the original game will be particularly excited for these new additions, as it breathes new life in terms of new encounters and character-interactions. 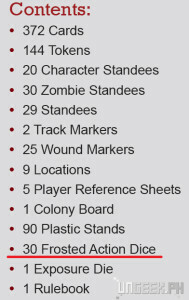 Aside from this, we can see that there are 30 Frosted Action Dice provided in the game… Now, this could just be the same action dice that is used just like in the previous game (only a bit more aesthetically-pleasing), or it could be something else entirely…New types of zombies perhaps? We now know that there will be a Prison Guard, a Public Speaker, and a Regular Guy in the game. You might want to check out that Regular Guy again. Seems familiar? Well it’s none other than Rich Sommer of Mad Men fame! Also look at the Rosa Rodriguez’ card; we can see that aside from killing zombies, there is now an option to eliminate bandits as well. The new Crisis cards are interesting as well… THE VAULT card (pictured on the leftmost side of the image) gives an option to reveal a personal secret (outside of game maybe?) to the other players. Any player who chooses not to reveal has to add 2 more zombies to the colony. 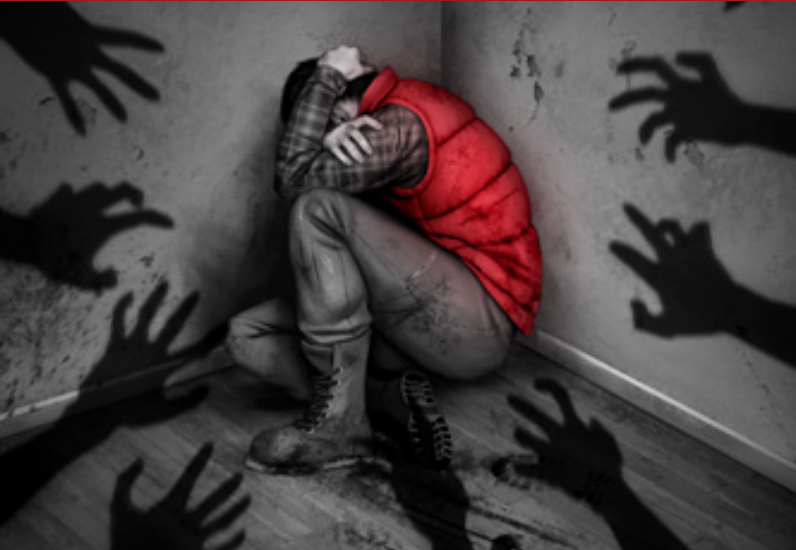 KIDNAPPED, on the other hand, instantly removes the survivor with the highest influence in the game, if the requirements are not met. Savage! These are just some of the info we got and we’ll be sure to give you the latest updates as the game draws ever nearer! Are you as excited for the game as we are?! 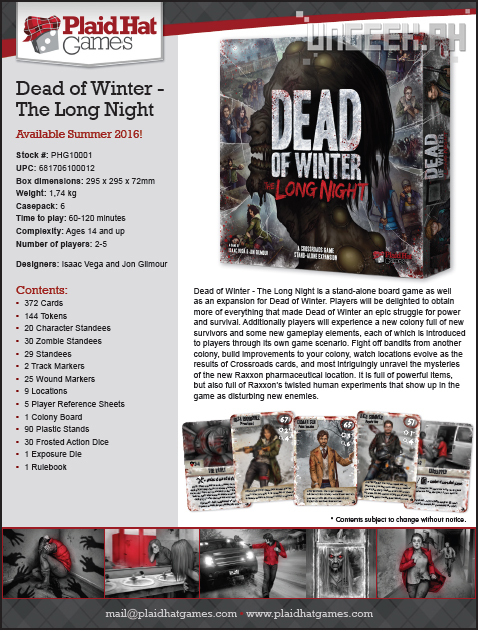 It’s slated for a GenCon release this August. We have even MORE GOOD NEWS! If you’re from the Philippines, you can pre-order the game RIGHT NOW! Just click HERE! For all the freshest news in gaming, hit that LIKE button on our Facebook Page and keep it here at UnGeek.PH! Anything we might have missed or something you would like to get featured? Hit us up in the comments section below. Till next time! Get to the table!